A classic 6 room beauty 3 Bedroom, 1. A classic 6 room beauty – 3 Bedroom, 1.5 Bath – prewar Greystone Coop located in prime historic Jackson Heights. Light streams through this top floor unit with oversized windows and three exposures offering calming views of greenery and landmarked buildings. A spacious living room and generously sized separate formal dining room provide plenty of space for gracious entertaining. The wood floors and plaster walls are in excellent condition and prewar details include high ceilings and original moldings and lots of lovingly exposed wood details. A renovated windowed kitchen features beautiful ceiling height wood cabinetry. The two bathrooms have both been updated. This apartment also conveniently includes its own washer/dryer. Enjoy the peace and tranquility only found in a top floor, six room coop. The Greystone buildings are walk-up coops and are on the National Register of Historic Places. This building is pet friendly and features a common laundry room, a super and a beautiful block long common garden with greenery. Each unit comes with its own private storage unit located in the basement as well as bike storage. Centrally located only 15 -20 minutes to Midtown Manhattan and easy access to all subway lines (E, F, M, R, and7), area airports, shops, Zagat rated restaurants, year-round Greenmarket, etc. 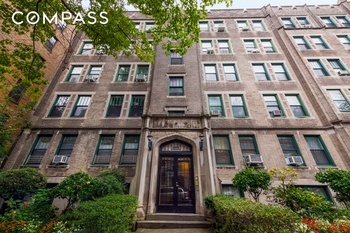 Come and see this beautiful 6 room prewar coop in Jackson Heights.